As a reference source, this book will help quantify the negative impacts on property values of high voltage overhead transmission lines, cell phone towers, and wind turbines. It gives a modern perspective of the concerns property owners have about the siting of industrial structures used to transmit or generate various forms of energy and how these concerns impact on property values. Studies reveal concerns the public have about devices and structures that emit electromagnetic fields (EMFs) due to their potential health hazards. . Despite some research reports suggesting there are no potential adverse health hazards from high voltage overhead transmission lines (HVOTLs) and towers, there is still on-going concern about the siting of these structures due to fears of health risks from exposure to EMFs, changes in neighbourhood aesthetics and loss in property values. The siting of wind turbines is also receiving community opposition due to noise, light flicker, aesthetic concerns, and loss in property values. The extent to which such attitudes are reflected in lower property values is not well understood. 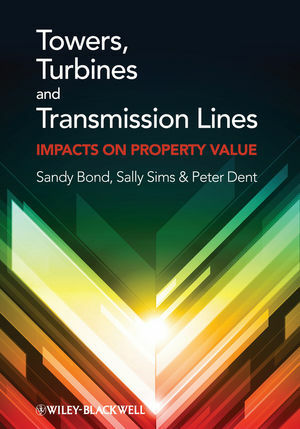 Towers, Turbines and Transmission Lines: Impacts on Property Value outlines results of studies conducted in the US, the UK, Australia and New Zealand and offers guidance to valuers as well as to property/real estate appraisal students and property owners around the world. The book provides defensible tools that are becoming widely accepted to assess the effect that these environmental detriments have on property prices. Dr Sandy Bond is the Professor of Property Studies in the Commerce Faculty at Lincoln University in Christchurch, New Zealand. She is a Registered Property Valuer and Senior Member of the Property Institute of New Zealand (SPINZ), the President-elect (2013) of the International Real Estate Society and a Past President of the Pacific Rim Real Estate Society (PRRES). She has lived and worked in NZ, the USA, UK, and Australia and her career has encompassed property valuation, valuation consultation, academic research and university teaching. Dr Sally Sims is a senior lecturer in the Department of Real Estate and Construction at Oxford Brookes University. She was a Member of the Stakeholders Advisory Group on EMF and is a member of the Editorial Advisory Board for the International Journal of Housing Markets and Analysis. Peter Dent is a Fellow of the Royal Institution of Chartered Surveyors. He has held various posts at Oxford Brookes University, most recently as the Comerford Climate Change Fellow in the Department of Real Estate and Construction. He has had considerable experience of managing both academic development and research projects both in the UK and overseas.